Michael Franti & Spearhead is kicking off their music and yoga tour – the Soulshine 2014 tour – at amphitheaters across the US this summer. Yes, yoga – bring your mat. Not only will fans jam out to music from Michael Franti & Spearhead and featured special guest artists (SOJA, Brett Dennen, and Trevor Hall), fans of all ages and all experience levels may optionally participate (before the concert) in the yoga session before the concert guided by acclaimed yoga gurus with live acoustic music by Michael Franti. 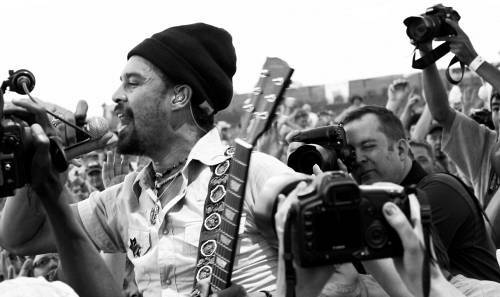 Exposed to music in his early college years in the Haight-Ashbury district (San Francisco) and influenced by reggae, punk, and rap, Michael Franti electrifies us with his up-beat, energetic sound and inspirits our soul with his message and uplifting lyrics. 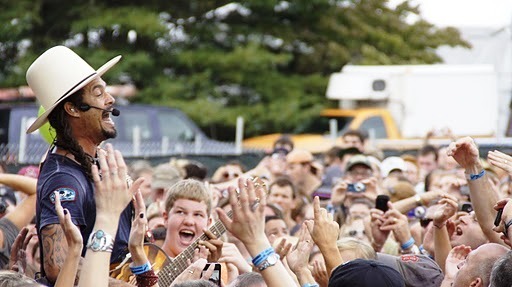 Michael is as much a philanthropist -- first-hand improving the lives of others in his numerous charitable works and projects – see All Love from his website, https://www.michaelfranti.com/all-love. Recently, Michael Franti’s youngest son, Ade, was diagnosed with a kidney disease called FSGS. 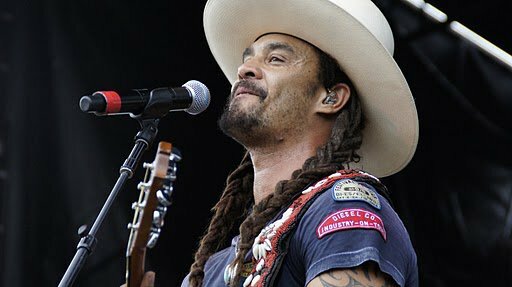 Unbeknownst to us of this recent condition threatening Ade before this interview, Grateful Web sits with Michael Franti as he talks music, inspiration, the prognosis of his son, Ade, and the upcoming Soulshine Summer 2014 tour. GW: Hi Michael. This is Vinh Nguyen with Grateful Web. Thanks for joining us. GW: How are you today? GW: Let me go ahead and start this off. I got 15 minutes with you Michael. Tell us how you first became interested in music? Michael: When I was a kid, my mother played organ in the church that we went to. Every kid in my family – we had five kids – every kid played an instrument except for me. I took one piano lesson and then I quit. [laughing] I played basketball when I was a kid. [Michael Franti is 6’6”] I went to the University of San Francisco and I played basketball there. My dorm room was right above the campus radio station. I think I ended up spending more time listening to the radio and going into the radio station than I did on the basketball court. I just fell in love with music. Our school was about five blocks away from Haight-Ashbury – San Francisco. So, I’d go down to Haight-Ashbury district and I would hang out with punk rockers, and hip-hop heads, and Deadheads. I just fell in love with music. I started (I didn’t pick up an instrument right away) doing vocals. I starting writing rhymes. Eventually, started my first band and never looked back. GW: What were you interested in back then – what bands and genre of music interested you? Michael: You know, I loved music that people had passionate things to say about in life and in the world. So, the things I identified with were punk rock and hip-hop. Because, you didn’t really need to know how to play an instrument really well. You can just use a drum machine, like a breakbeat, or learn three guitar chords and stand up there and say what you felt. This was the music that I loved. I love the clash. I love Run DMC. I love Public Enemy. I love the Police, etc. GW: You had a wide range of interest. GW: Your lyrics are inspiring. Where do you get this? GW: This is your son? Michael: Yeah, my son. His kidneys have lost 50% of their function. You know, it’s been a very difficult thing – an emotional thing for my family. I remember the first day that I learned about it; we were actually doing a show at the Sweetwater [Sweetwater Music Hall] in Mill Valley, which is owned by Bob Weir. I got out and started singing. Bob and I were doing a song together. And, I just bursted into tears. It was the music that moved me to really get in touch with everything that I was feeling about my son…possibly…dying. And then, the experience of writing the song, giving the song to my son, listening to it together in the car, just passion through that emotion, music has been the thing that has fed my soul in the times when I needed it the most. And, that’s why I did it. GW: How is your son doing right now? Michael: You know, he’s doing really well. The disease that he has is one that it’s difficult to tell how fast it’s going to spread or how fast it’s going to move. He still has 50% of his kidneys remaining, which potentially you can live forever like that. But, it has only been a matter of months since they’ve gotten that back. So, we’re just waiting to see how it progresses. We’ve done a lot of nutritional things and medicinal things to hopefully prevent his kidneys from getting worst at a fast rate – slow down the disease. GW: I wish you the best with that Michael. GW: You travel quite a bit. Is there a specific experience in your travels you want to share – anything that stands out for you? Michael: …[belongs?] in a museum somewhere. But, that sense of history that you see where civilization has come from, things that lead up to where they are now and where we’re going in the future – tells us where we’re going in the future. My music has always been something that I try to question where we are, examine where we are and hopefully to create a brighter future than the one that – the thing that we’re heading to. GW: As far as where we are at today, what do you think about our mainstream culture today? Michael: I feel there so much emphasis placed on gossip and commercialization. You start to feel frustrated. And then, I find people who are doing amazing things, making great music, and telling great stories about things that are happening in the world. And, I get really inspired again. I feel really uplifted. So right now, I’m hopeful for the future but I hope the future gets here soon. GW: Speaking of great things, you do many great things for people. Do It For The Love Foundation is something you started. Tell us about that foundation? Michael: Do It For The Love idea came from the experience of a man who came to one of our show last year. He was dying of ALS, Lou Gehrig’s disease. I was with my girlfriend. And, we were so inspired meeting him and his wife. Seeing the love that they had and how much the concert meant to them -- How much it moved them – that we decided to start Do It For The Love to bring people with advanced stages of life threatening medical conditions, kids with severe challenges and wounded veterans to live concerts. People can go to our website (http://doitforthelove.org) and you can either see the list of participating bands or just tell us any band that you want to see – and we’ll get tickets for them, the people in need. It’s kind of like a Make a Wish foundation for me. GW: That’s great! You have an upcoming tour across America -- The Soulshine Tour, Summer 2014. Tell us about this tour. Michael: First of all, the artists are SOJA, Brett Dennen and Trevor Hall. It’s the first tour that combines music and yoga. I’ve been practicing yoga now for 13 years. Every city that we go to, I always go to a yoga class. Over the years, we started having fans come and practice yoga before the shows backstage, in the parking lot or wherever. Last year at Red Rocks, we invite fans to come and I was going to do an acoustic music set while this teacher taught yoga class. We thought a couple of hundred people would show up in the afternoon before the regular show but we had 2000 people show up. We thought why not do this in every city on the tour. So at every stop that we’re going, we have a yoga class that goes on for an hour with acoustic music by myself and other artists on the tour. If you never practiced yoga before, it would be a great way to try it for the first time. If you’re an experienced practitioner, we got some of the best yoga teachers in the country who are going to be out with us on tour. If you just want to come listen to acoustic music, just show up early, bring a picnic, and have some fun. GW: Yoga happens before the show? Michael: Yeah, so it will be about 4:00 in the afternoon or something like that depending what city we’re in. Then, the proper full-on rock concert experience will happen after that. GW: Alright. My understanding, this is design for all ages and all levels. GW: Did I hear this right that you guys are offering yoga mats or should they bring their own? Michael: Yeah, we’ll have a bunch of mats. So if you don’t have one, we’ll have mats for people. If you have one, it’s probably best to bring your own. GW: Yoga is part of our workout routine you do everyday? Michael: Yes, I’ve been practicing yoga now everyday on tour either before soundcheck or after soundcheck. I’ll just roll out my mat. My bandmate Jay Bowman also practices. We also go to different teachers and different school in the town that we are in. GW: Ok, let me go ahead and conclude this with you. If there’s any last word or anything I missed, I’ll leave this to you. Michael: We’re super excited about this tour this summer because all four bands are artists we’ve known – we’ve known each other for many years. So, there’s going to be lots of jamming between the bands. I’m guessing in the sets there will be some artists from each act that will be joining other artists to do songs. Yoga is going to be great. It’s just going to be a fun tour and we’re looking forward to it. GW: Great, we’re looking forward to seeing you on tour. Thank you again Michael for having us. Michael: Thanks for helping us get the word out. GW: Ok, good luck this summer.